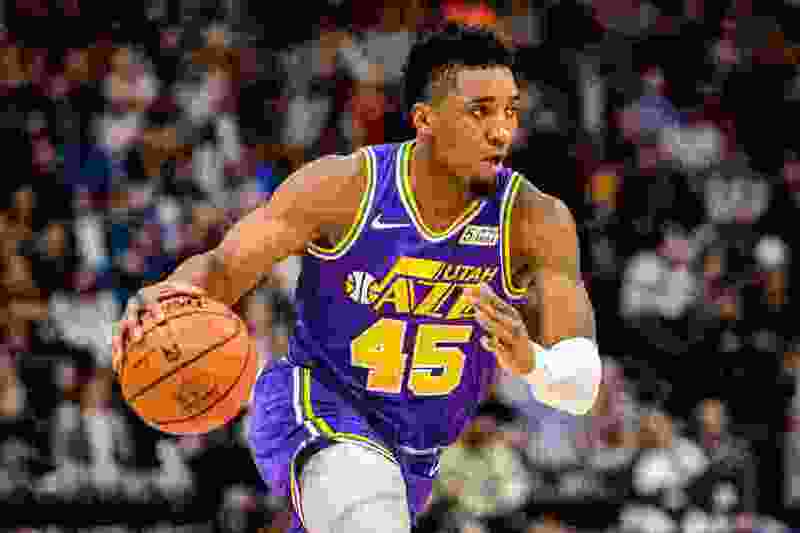 (Trent Nelson | The Salt Lake Tribune) Utah Jazz guard Donovan Mitchell (45). The Utah Jazz host the Houston Rockets, NBA basketball in Salt Lake City on Thursday Dec. 6, 2018. Houston • Donovan Mitchell’s Game 1 against the Rockets won’t go down as one of his more memorable performances, which makes it all the more ironic that his numbers are, for now anyway, seared into the memory banks. Seven for 18 shooting … five turnovers … zero assists. Over the past few days, the Rockets have made it known that they view being physically antagonistic with Mitchell as paramount to their ability to limit Utah’s offense as a whole. The Jazz’s offensive woes — 90 points; 19 turnovers; 39% shooting; 7 of 27 from deep — certainly weren’t all Mitchell’s fault, but no one disputes that for the team to be better on that end in Game 2, they will need more out of the second-year guard. So this is just another one to put on the résumé. Snyder said he has been working on ways to help change things up for the Louisville product and give Houston’s defense some different looks — perhaps putting the ball in his hands more in certain situations to initiate; at other times, running him through more off-ball actions; maybe having him make his move earlier in the shot clock. That last bit of emphasis stands out. Snyder said he and assistant coach Johnnie Bryant have made it a point to reiterate that “quick decisions” are imperative. Mitchell sometimes had a moment to attack the Rockets’ switching defense in Game 1, but too often hesitated a fraction of a second too long, causing opportunities and advantages to evaporate. For all the different things Snyder said might occur, though, Mitchell was focused on not switching things up too much. For their part, the Rockets were in no rush to take credit for limiting Mitchell, saying they fully expect him to be in attack mode in Wednesday’s rematch. James Harden, who has gotten to know Mitchell well through their mutual endorsements with Adidas and Body Armour, was asked if being around the Jazz guard off the court (such as when they are filming television advertisements) gave him any added insight into what makes him tick, thereby providing an in-game advantage. The reigning Most Valuable Player laughed off the idea. Meanwhile, Mitchell’s teammates have vowed to step things up to help him out. Told the Rockets had mentioned getting physical with Mitchell, Jazz big man Derrick Favors said it was incumbent Utah’s players to get physical in return if that’s what it takes to free him up. In the end, Snyder said, progress will depend on the entire team making improvements. About the Jazz • Forward Kyle Korver (right knee soreness) is probable to play, but Thabo Sefolosha (left hip soreness) is questionable. … Utah enjoyed a substantial advantage at the free-throw line in Game 1, making 23 of 27 attempts, compared to Houston going 11 for 12. … The Jazz’s reserves struggled shooting the ball in Game 1, connecting on only 4 of 26 tries. About the Rockets • Their 32-point margin of victory in the first game was tied for their second-biggest playoff win ever. They beat the Suns by 33 in 1995, and the Knicks by 32 in 1975. … Seven Rockets players scored in double figures in Game 1 — something the team accomplished only five times in the regular season. … James Harden had 29 points and 10 assists in Game 1. Over the last two postseasons, he’s racked up 10-plus assists four times in 18 playoff games — three of which have come vs. the Jazz.